This is a time lapse of what happens when you leave a dead elephant on the savanna. Yes, it's like the Lion King, but really gross. Don't play it if you don't want to see leopards, hyenas and flies putting all those proteins and carbohydrates back into the ecosystem. 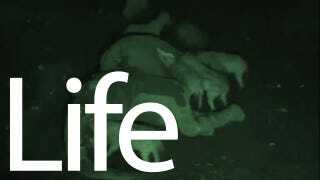 Filmed with remote cameras and night vision gear, this fascinating video is part of The Elephant: Life after Death, a program filmed in the Tsavo West National Park, Kenya, and hosted by biologist Simon Watt for UK's Channel 4 along with a team of experts in biology and animal behavior. The above is just a timelapse of the whole process, but the documentary goes through it all in stunning detail, showing "six million calories worth of fat, meat and guts" get transformed by big animals—like leopards, hyenas and vultures—and small creatures—like beetles, flies and maggots—"feeding a whole new cycle of life." All in just a few days.